It's been almost a week since the finale, and I've cried out all my feelings. How do YOU feel now that it's over? Taage: To be honest, it hasn't completely sunk in yet. Having lived and breathed Endless Summer for almost a year now, I'm starting to feel just as marooned on La Huerta as the characters! There's certainly a deep sense of relief. Endings can be nerve-wracking to write, especially on a tight deadline, so I'm very happy that it's done and players are enjoying the conclusion of our journey together through time, space, and the self. Jen: This was the first Choices book I got to write on and I immediately fell in love with the characters from books 1 and 2. It feels bittersweet to not be writing them anymore, but I'm proud of the send-off we gave them. Luke: This was always a story about letting go and moving on, so it’s time to do just that. These characters meant a lot to us, and we’ll always carry them with us. There were three choices in the final chapter. Which would you have chosen? Taage: I love all three endings for very different reasons... but I'm closest to the option that involves Vaanu. Andrew: This is a weird answer, but I actually think the Rourke ending. On the surface, it seems bad (and it was a lot of fun writing the Darkest Timeline) but on playing it, I think there's actually a weird hopeful undercurrent, the promise of a new adventure. I really love those 'the battered heroes reunite against impossible odds, fighting together even if it means death' endings, and I think the Rourke ending actually kind of promises that. Let's rewind. Brainstorms for Endless Summer kicked off during the summer of 2016. I remember the story changed a lot in the process. Diego was called Ben, the title was different, and the trees were sentient... Can you talk about how Endless Summer took shape? Luke: Whew, this series had a crazier backstory than its characters did. The premise went through a ton of iterations, we almost pulled the plug on it early in the process, and the wedding bride was originally going to be Book 1’s big bad. But after dozens of hours of me and Andrew whiteboarding in a tiny conference room, we came up with the Book 1 we have now. Andrew: Yeah, Endless Summer went through a LOT of interesting iterations before we hit on the version that worked. There was a version where everyone on the island was your ex, and one where the island was actually the top of the sunken continent of Atlantis. Even the first full outline was pretty different, a lot darker: the island was full of plant-zombies, there was a professor who got eaten, and Aleister ended up being a serial killer! Luckily, we figured out that we wanted something lighter, more heartfelt and adventurous, and I think we were all thrilled with the result. What was your favorite part of making Endless Summer a reality? What was the most challenging? Andrew: From the start, Endless was conceived as an experimental series where we got to try new things, and the most fun I had was getting to go wild with new ideas. The relationship system, the collectibles, the cutscenes, that one chapter in book 1 where I got to design an escape room... it was a total blast, and a huge thanks to QA for testing all our super-complicated new stuff! The hardest was definitely the overall plot, and finding a way to connect all our ideas and pieces into a frame that both made sense and was emotionally satisfying. I'm honestly kind of amazed we pulled it off: we had a long list of 'mysteries to solve' and we got through almost every single one of them. Taage: Writing the handfasting chapter may have been my most challenging and transformative experience. It was essentially five weddings in one, which was quite an undertaking. By the end, I'd gone from being a low-key cynic who didn't care for flashy weddings to a full blown romantic with dreams of my own big day. I'm also proud to have worked on some of the puzzles, and Varyyn and Diego's evolving relationship, among other things. Jen: I got to write a lot of deeply emotional scenes for book three, which I loved doing. What I'm proudest of was getting to write Quinn's Ember scene. As someone who also has an auto-immune disease, it meant the world to me to imbue a character like Quinn with all of the words I needed to hear at the beginning of my diagnosis. Seeing fans with chronic illnesses react to that scene is the current highlight of my writing career. Some story threads took multiple books to pay off, like who the missing wedding party ended up being. Were there any Easter eggs, details, or callbacks that you think readers may have missed? Taage: Choices readers have sleuthed out many of the mysteries, and it's been a privilege to write for such an engaged audience. One clue I haven't seen mentioned occurs in Book 2 when Iris sings part of a traditional lullaby about giving her love "a baby with no crying." Luke: Players may have caught this already, but the three endings were meant to represent reliving the past, holding on to the present, and moving forward into the future. Also, for any old-school Cause of Death fans, Raj got his name from an idea we considered to have him travel back in time and become Raj Mansingh, Natara’s dad. This is absolutely non-canon! Andrew: Honestly, our fans are so sharp I think they caught almost everything. At heart, Endless Summer is a story about growing up -- about the summer where you graduate college and become an adult, and about the deep yearning to stay in the safety of sustained adolescence versus taking the plunge into the scary world of adulthood. We didn't intend it initially, but Endless Summer wound up with the underlying theme of "Every summer has to end." 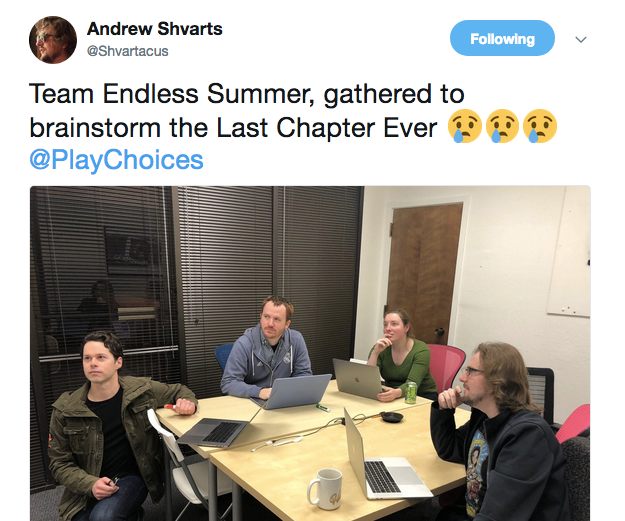 What will you be working on post-Endless Summer? Luke: That's under wraps right now. Jen: I'm working on a really fun new project that I think Endless Summer fans will really enjoy! Any final messages for Endless Summer readers before we wrap this up? Jen: Thank you so much for playing. This story wouldn't exist without the fans who adored it. Thank you for your conspiracy theories and your fanart and your heartwarming messages about how much this story and these characters mean to you. I can't wait to show you all the new projects we're working on! Luke: Endless Summer was able to reach this point because of dedicated fans tuning in every week. Thanks to each of you for supporting this crazy adventure from day one. Taage: Here's to adventure! Jake is 5'9'' in boots, pass it on. Team Endless Summer! As with all Choices books, it takes a village to raise a series. That means writers, QA testers, artists, and everyone in between. *Wipes away a tear* Endless Summer has ended, but we hope that your stay at La Huerta has been memorable. Keep an eye out for updates on what these writers and the rest of the Choices team has planned next!